A new UFO/extraterrestrial-themed exhibit is opening in Myrtle Beach, South Carolina. 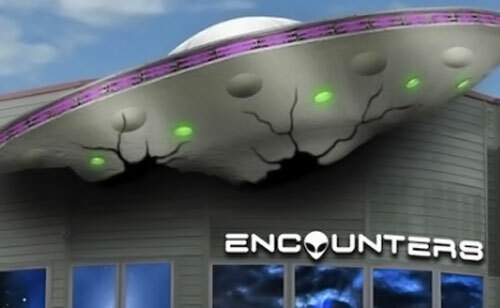 The grand opening of Encounters: UFO Experience takes place on April 4 at the Myrtle Beach exhibit space Broadway at the Beach. According to Myrtle Beach Online, this exhibit is the result of more than five years of research, and three years of assembling content and artifacts. Encounters: U.F.O. Experience is an out-of-this-world family-friendly exhibit based on the widespread interest in alien life. Within its seven galleries, it incorporates over 200 original and reproduction artifacts, documented film and recordings, conceptual models and interactive experiences. Replicas throughout the exhibition are based on reports of alien encounters. This extraordinary extraterrestrial experience is the first of its kind, and is making its world debut in Myrtle Beach, S.C.
Myrtle Beach Online explains that Broadway at the Beach was selected as the venue for the Encounters exhibit because of the success of the location’s previous exhibit Bodies Revealed, in addition to the area’s substantial tourism traffic. Myrtle Beach is also appealing to the exhibit’s developers due to the large number of UFO sightings in the area. The exhibit will host occasional UFO-related lectures. The first lecture, presented by nuclear physicist Stanton Friedman, will take place from 3-4 p.m. on April 4 at the nearby Legends in Concert. 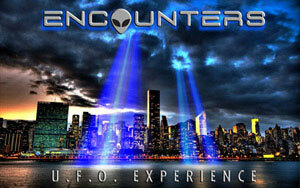 Encounters: UFO Experience is scheduled to run through September 2.